Over the last 400 years, planes have evolved from being constructed of wood, to being largely constructed of metal, and the ubiquitous infill planes which are hybrids of a sort. No woodworking tool has undergone the type of evolution that planes have. Prior to 1600, there are very few specimens, apart from a few Roman planes some of which pre-date Pompeii in A.D.79. This could be largely because they were made of wood, and discarded when worn out – the metal blade used in another plane, or recycled into a new blade. They existed in a time when there were likely very few collectors. Joseph Moxon (1627-1691) was an English printer of mathematical books and maps. In 1703, the 3rd printing of his book “Mechanick Exercises: or the Doctrine of handy-works” appeared, which described the five trades of smithing, joinery, carpentry, turning, and bricklayery. Within the section on joinery, he describes the various tools of the joinery trade. His description starts with “Plains of Several Sorts“. From Joseph Moxon’s “Mechanick Exercises”, (3rd ed. 1703). One of the most interesting aspects of Moxon’s drawings is the aesthetic appeal of the planes. Compared to planes that came later, these planes are extremely curved, which likely makes them quiet ergonomic to use. The curve of the handle is most interesting because it provides a more top-down approach to applying pressure (?). The use of curves shows a deep reverence for the plane makers craft, something that would disappear with the introduction of industrialized plane making. Features like the curve to the upper front throat is unusual because it likely doesn’t serve a functional value. plain – meaning “flat, smooth”, from the Old French plain. Often used in lieu of the term plane. 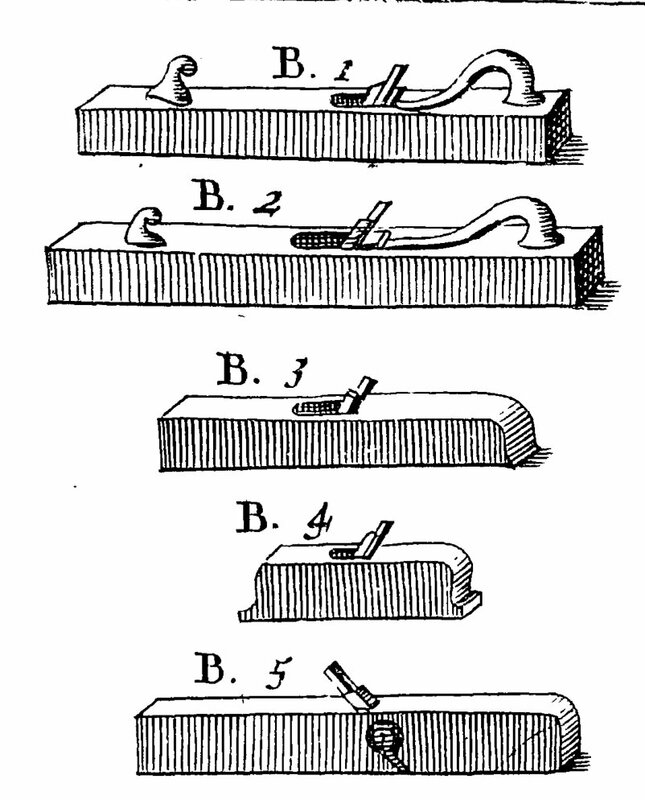 B.1 A Fore Plain – It is called the Fore Plane because it is used before working with either the Smooth Plane or with the jointer (joynter in 1600s English). Described as using a blade with a convex arch in it as opposed to a blade with a straight edge which could in Moxons words “dig gutters on the surface of the stuff”. B.2 Of the Joynter – Somewhat longer than the fore-plane, it has a sole perfectly straight from end to end. It’s purpose is to follow the fore-plane, and to shoot an edge perfectly straight, and not only an edge, but also a board of any thickness. Moxon also mentions that the blade of the joynter must be set very fine. B.3 The Use of the Strike-block – The strike-block is a plane shorter than the joynter having a sole which is exactly flat and straight, and is used for the shooting of a short joynt, because it is more handy than the long joynter. It is also used for the framing, and fitting the joints of miters and bevels. B.4 The Use of the Smoothing Plane – The smoothing-plane has a very fine iron, because its work is to smoothen the irregularities made by the fore-plane. B.5 The Use of the Rabbet Plane – The rabbet-plane is used to cut part of the upper edge of a board, i.e. square down into the board, so that the edge of another board cut in the same manner, may fit and join into the square of the first board cut this way. When two boards are lapped like this on the edges over one another, this lapping is called rabbetting.